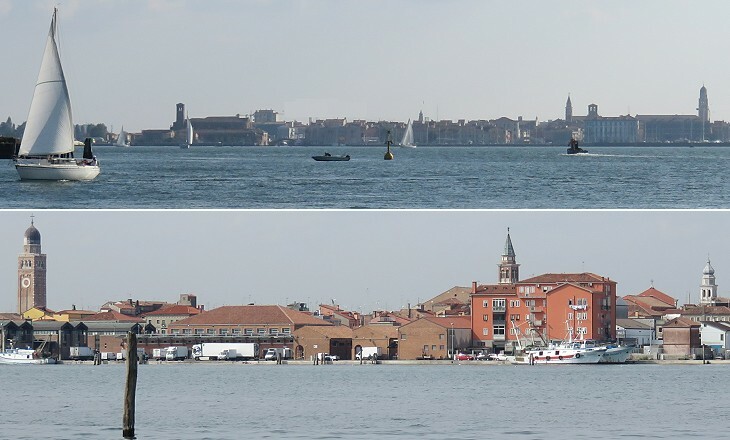 The panorama of the southern lagoon is best seen in a voyage to Chioggia, the quaint and historic little city that lies twenty miles away from Venice. 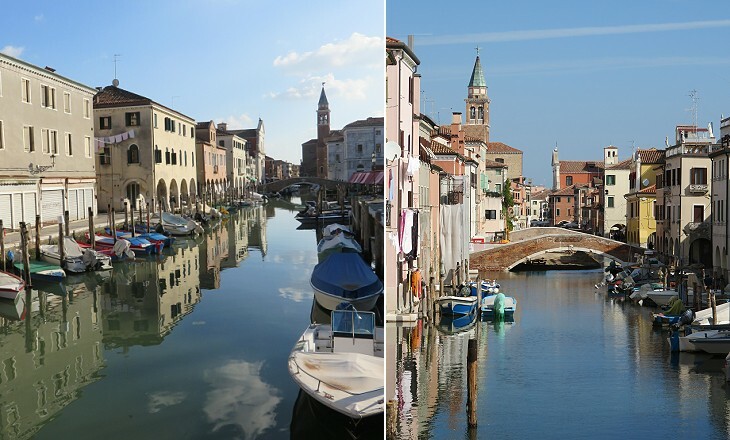 (..) Chioggia itself is hardly more than a village, a Venice in miniature, with canals and boats and bridges. A precious day from beginning to end! 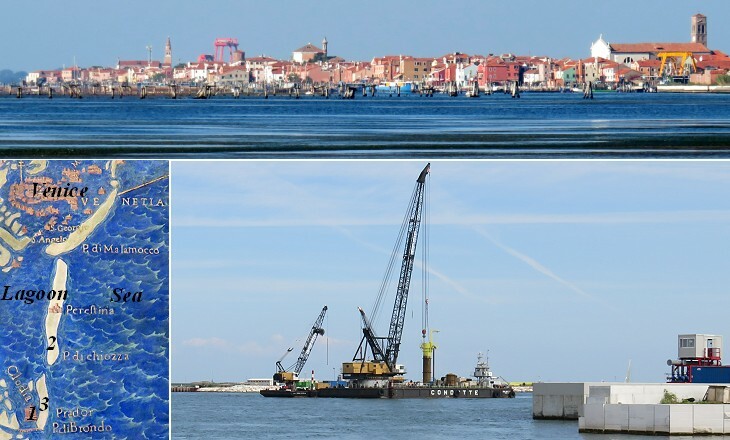 I visited Pellestrina and Chioggia, where the Republic is constructing huge defences against the sea called "i murazzi". These are built of uncemented stone blocks and are intended to protect the Lido in times of storm. (..) They are constructed as follows. First come some steep steps, then a gently inclined surface, then another step, then another incline and finally a vertical wall with a coping on top. The rising sea climbs the steps and slopes and only when exceptionally violent does it break against the wall and its coping. Two very long barrier islands (Lido and Pellestrina) separate the Lagoon of Venice from the Adriatic Sea. Three narrows which are called bocche (mouths) allow the interchange of water between the sea and the lagoon. The murazzi ensured that sea water did not make its way across the islands into the lagoon. MOSE, a system of mobile gates, is under construction at the three narrows to complement the protection given by the murazzi by completely sealing off the lagoon during weather conditions which could cause exceptional tides. The Venetians did not limit themselves to protecting the lagoon from natural disasters. In 1379 the Genoese fleet, after having defeated the Venetian one off the harbour of Pola, entered the lagoon at Bocca di Pellestrina. The Genoese stormed Pellestrina and Sottomarina and laid siege to Chioggia which they seized on August 16. Venice itself was at risk of falling to its arch-enemy, but its citizens managed to launch a counterattack and in June 1380 they were able to dislodge the Genoese from Chioggia. The Senate decided that Venice should not be in such danger again and Bocca di Pellegrina was fortified by building two small castles. In 1538 the southern one (near Sottomarina) was replaced by Forte San Felice, a state-of-the-art fortress. In addition cannon were placed on some fortified small islets inside the lagoon which are known as ottagoni, because of their octagonal shape. 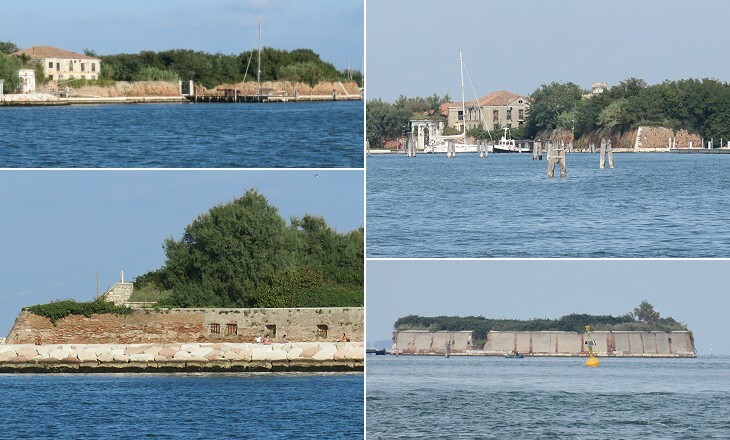 You may wish to see the fortifications built by the Venetians to protect the Lagoon of Santamaura in Greece. The fortress was part of an overall defensive system which included Forte S. Andrea and Forte S. Nicolò at the northern entrance to the lagoon. In 1537 the Ottomans vainly tried to seize Corfu, but in the following year they defeated a Christian fleet at Preveza, so the Senate was worried they could plan a raid on Venice. In those same years fears of an Ottoman attack led Pope Paul III to strengthen the fortifications of Rome. 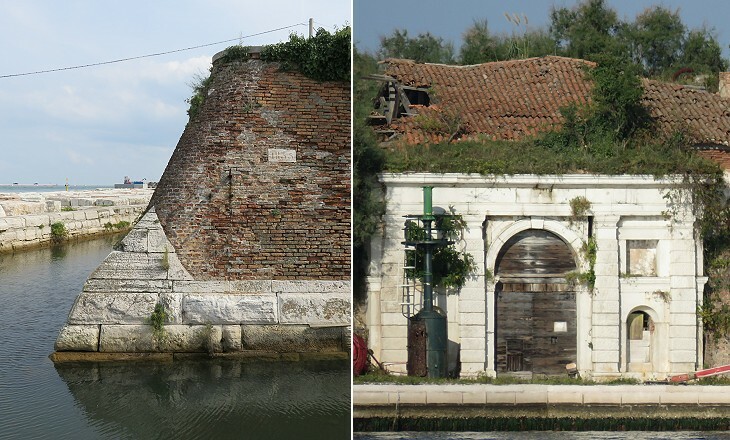 Forte S. Felice and the other fortifications of the Lagoon were never put to a real test because the Ottomans did not dare to attack Venice. 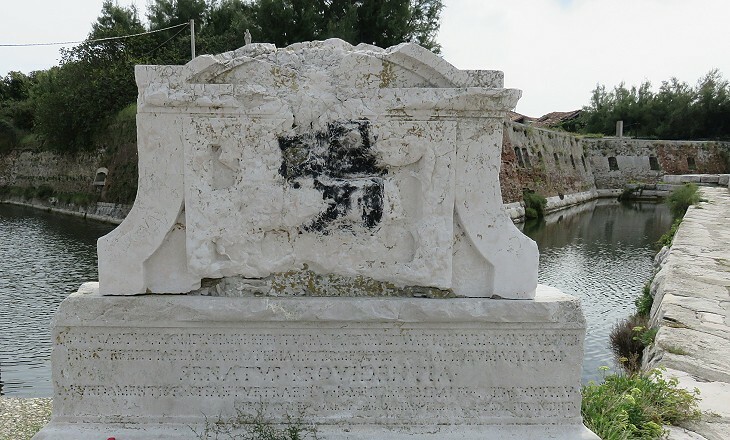 The Republic died of "old age" in 1797 when its territory was occupied by the French and its symbols were defaced. Forte S. Felice was upgraded to new warfare standards by the Austrians in 1835 and it continued to be used by the military until after WWII. Today it is abandoned while a decision on its future use is pending. 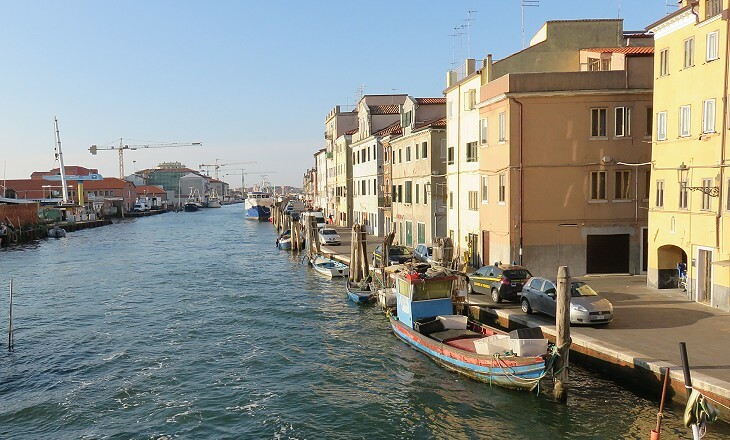 Chioggia has a roughly rectangular shape and it is divided in half by Canal Vena. Its urban layout is mainly man made and Canal Vena was dredged to allow boats to cross it even at low tide. The buildings of Chioggia stand on wood pilings driven into the mud. Vena means vein and in Italian it can be used to indicate a small flow of water. The bridge is the final leg of a road which links Chioggia to Padua. 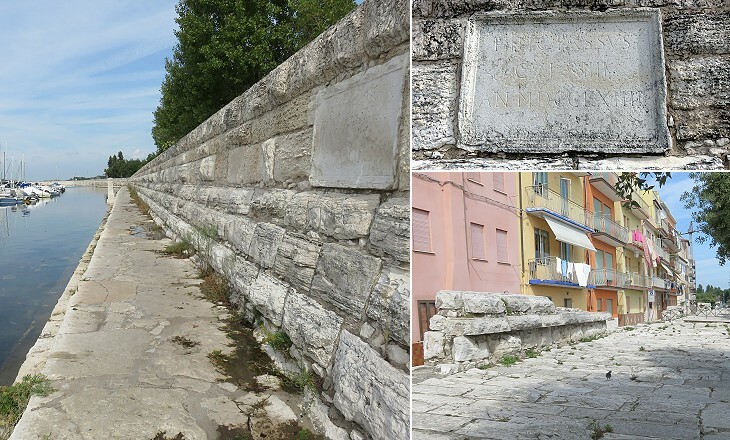 It has been enlarged to allow cars to enter the town and the walls at the sides of Porta di S. Maria have been pulled down for the same reason. 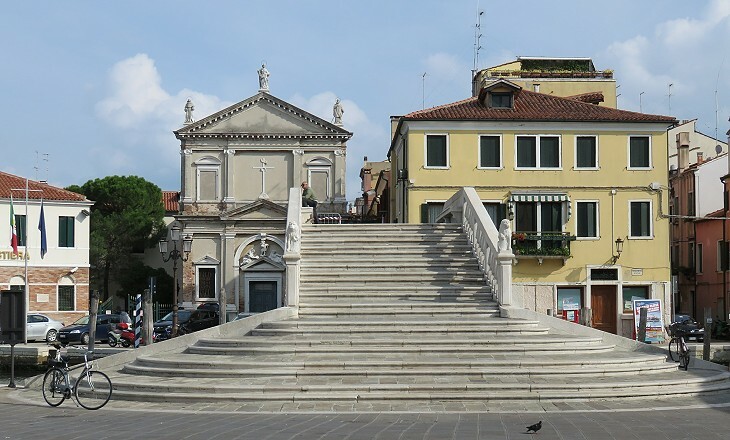 A new bridge links Chioggia to Sottomarina thus allowing its inhabitants to enjoy the hazards of modern life, at least in the section of the town between the two bridges. Ponte di Vigo is the only monumental bridge of Chioggia and it is situated near the landing point of the ferry. It was built in 1685 to replace a wooden one and in 1762 it was decorated with marbles and small statues. When people eating a slice of pizza are not sitting on its steps it fully shows its neat yet elegant design. Reaching Grado we entered a straight canal between embankments which led to the port, a tolerably capacious basin full of gaily-painted boats from Chioggia. The men throughout the islands of Venice are almost as handsome as the women; I have never seen so many good-looking rascals. At Burano and Chioggia they sit mending their nets, or lounge at the street corners, where conversation is always high-pitched, or clamour to you to take a boat; and everywhere they decorate the scene with their splendid colour - cheeks and throats as richly brown as the sails of their fishing-smacks. 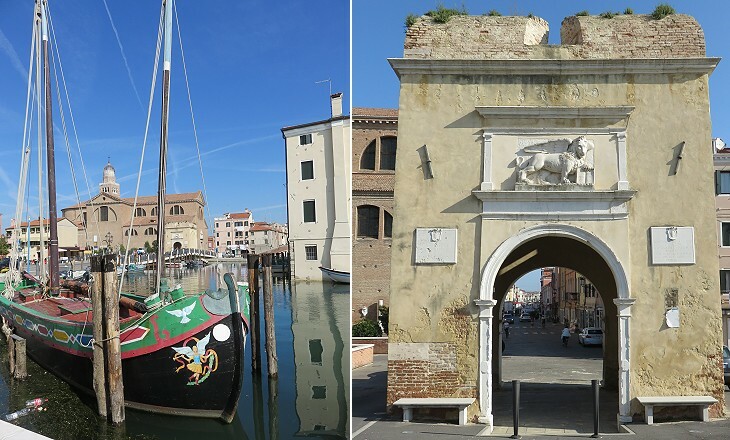 Chioggia is still a major fishing port and facilities for modern boats have been built on the eastern side of Canal San Domenico. 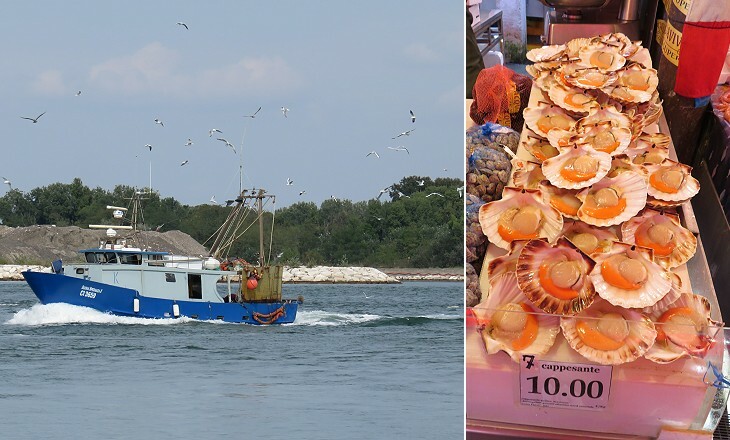 Broeto ciozoto is an excellent fish soup served at several Chioggia restaurants for the same price as the cost of a pizza in Venice. The image used as background for this page shows three bragozzi, the fishing boats for which Chioggia and its fishermen were renowned.